Bonito is so deeply intertwined with the Japanese food culture and history. Bonito is the main key ingredients for making wonderful "dashi" used in many of Japanese recipes. Bonito is also popular to eat as "Tataki"(seared) , especially in May-June, Sep-Oct. 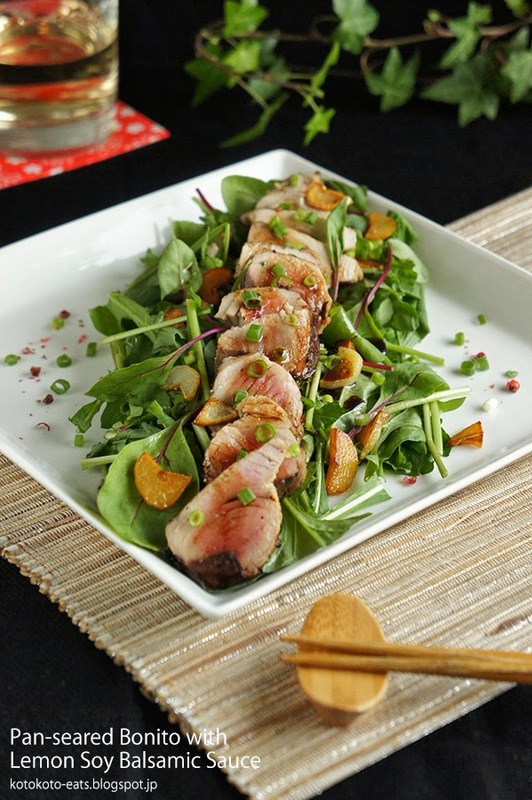 Here is one of my favorite recipe for seared Bonito. Whenever I make this, my friends just cannot have enough of it! Since the Bonito will be lightly seared, please make sure it is "Sashimi" quality(fresh enough to eat it raw). If it is difficult to get Bonito, then it can easily be replaced by fresh Tuna/Ahi. Because this itself is a quite colorful dish, I wanted to make the surrounding color pretty basic. Since Bonito is the most tasty in warm season (early Summer & early Fall), I also wanted to create the warm weather feeling by using the fresh greens and white wine as props. 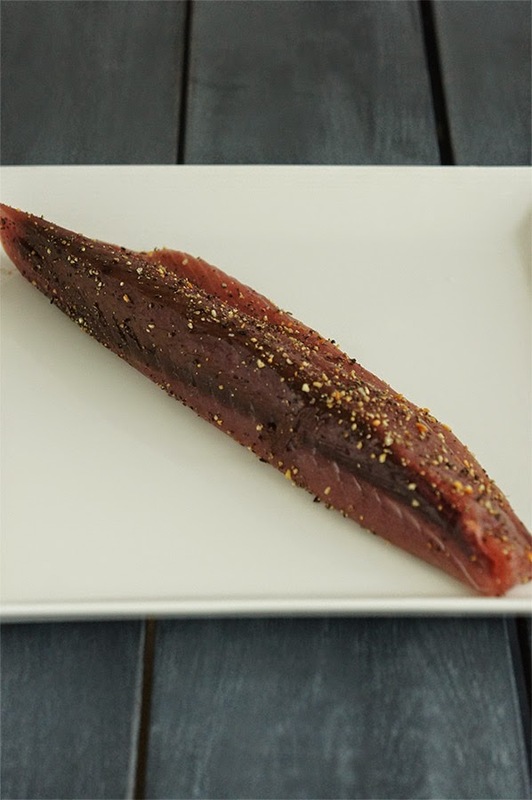 1) Apply cracked black pepper liberally on all sides of the Bonito. Sprinkle salt as well. Set aside for about 5minutes. 2) Slice the garlic. Add olive oil to the frying pan, and fry the garlic til golden. Remove the garlic slices and set aside. 3) Place the Bonito filet in the frying pan. Sear each side for about 30 - 50 seconds each on high heat. Remove when the Bonito is seared on the outside, rare on the inside. 4) Remove the Bonito and set aside. In the same frying pan, add soy sauce, balsamic vinegar, and lemon juice. Bring to boil and set aside til it cools down. 5) Place the baby leaf & arugula on a plate. Add sliced Bonito over the greens. Use the fried garlic as the topping, sprinkle some chopped scallions and pour the sauce. This can be shared as an appetizer, or if you feel like a light meal, this can easily be served as an Entree.